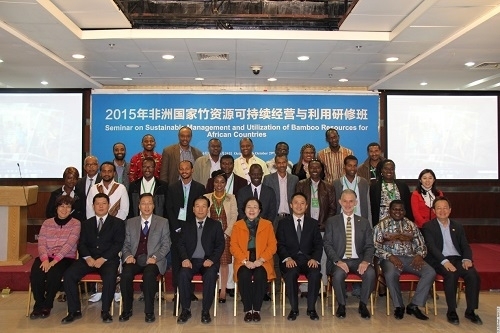 On Oct. 29th, the 2015 Seminar on Sustainable Management and Utilization of Bamboo Resources for African Countries, hosted by the Ministry of Commerce, organized by the International Center for Bamboo and Rattan (ICBR) and co-organized by the International Network for Bamboo and Rattan (INBAR), concluded in Beijing. This 21-day program instructed 21 government officials from five African countries on the topic of the sustainable management and utilization of bamboo resources. Prof. Jiang Zehui, Vice Chair of the Committee of Population, Resources and Environment of Chinese People’s Political Consultative Conference (CPPCC), Co-Chair of INBAR’s Board of Trustees and Director General of ICBR, Mr. Wu Zhimin, Executive Director General of International Forestry Cooperation Center of the State Forestry Administration, Mr. Xu Kai, Director of the Academy for International Business Officials, Dr. Hans Friederich, INBAR Director General, attended the closing ceremony. 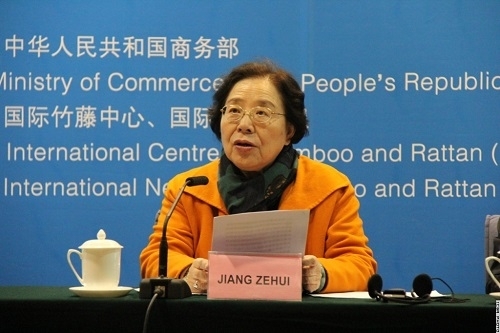 Prof. Liu Shirong, Secretary General of CPC Committee of ICBR presided at the ceremony. 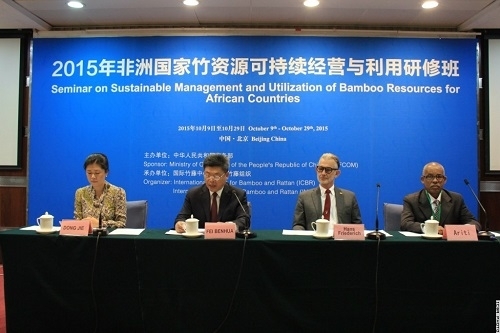 Prof. Jiang mentioned that since 2005, ICBR had altogether trained 727 government officials from 78 countries through 25 seminars on bamboo and rattan, contributing greatly to the sustainable management and utilization of bamboo resources, and to the enhancement of South-South cooperation. Extensively distributed, bamboo resources represent an asset to economic, social and ecological development and can offer immense possibilities to poverty alleviation, job creation and the sustainable development of the rural economy, society and environment. Growingly, people’s attention is being drawn to the sustainability of bamboo resources, the quality of bamboo products and the advancement of the bamboo industry. To improve the sustainability and utilization of bamboo resources will help to manufacture safer bamboo products, find out new ways to use bamboo resources, upgrade the traditional industry, and standardize the international bamboo trading. This seminar is also a lever for INBAR to better serve its mission and purpose, comply with the INBAR Host Country Agreement, uphold the sustainability of bamboo resources and enhance South-South cooperation. The seminar for African countries offered not only opportunities for exchange of ideas but also field trip activities, including visits to the plantation of high-yield moso bamboo, manufacturers of high-tech bamboo products, green houses built with bamboo-wood composites and the repository for Taiping bamboo germplasm resources in Zhejiang and Anhui provinces.